Whole house cooling using a whole house fan can substitute for an air conditioner most of the year in most climates. Whole house fans combined with ceiling fans and other circulating fans provide acceptable summer comfort for many families, even in hot weather. In addition to whole house fans, the ducts of your central heating and cooling system can be modified to provide whole house cooling. The whole house fan pulls air in from open windows and exhausts it through the attic and roof. It provides good attic ventilation in addition to whole house cooling. Whole house fans should provide houses with 30 to 60 air changes per hour (varies with climate, floor plan, etc.—check with a professional to determine what is appropriate for your home). The air-change rate you will choose depends on your climate and how much you will depend on the whole house fan for cooling. Whole house fans are sized in cubic feet per minute (cfm) of cooling power. To determine the size you’ll need, first calculate the volume of your house in cubic feet. To do that, multiply the square footage of the floor area you want to cool by the height from floor to ceiling. Take that volume and multiply by 30 to 60 air changes per hour (depending on the power you need). Then, divide by 60 minutes to get the cubic feet per minute of capacity your house requires. Installing a whole house fan is tricky and should be done by a professional. An experienced professional should take your attic measurements and install your dedicated circuit wiring and, if needed, your new attic vents. Attic ventilation will usually need to be increased to exhaust the fan’s air outdoors. You’ll need 2 to 4 times the normal area of attic vents, or about one square foot of net free area for every 750 cubic feet per minute of fan capacity. 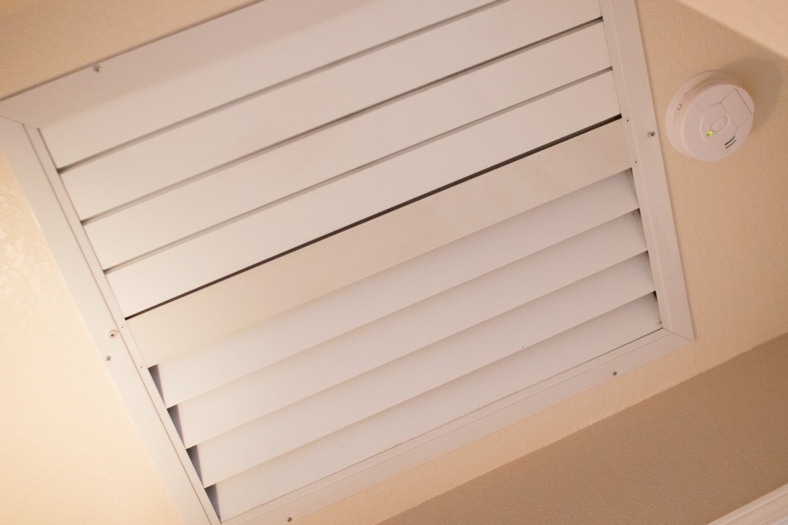 The net free area of a vent takes into account the resistance offered by its louvers and insect screens. More vent area is better for optimal whole house fan performance. If your fan doesn’t come with a tight-sealing winter cover, you should either buy one or build one. If you switch between air conditioning and cooling with a whole house fan as the summer weather changes, build a tightly sealed, hinged door for the fan opening that is easy to open and close when switching cooling methods. Be cautious when operating these large exhaust fans. Open windows throughout the house to prevent a powerful and concentrated suction in one location. If enough ventilation isn’t provided, the fans can cause a backdraft in your furnace, water heater or gas-fired dryer, pulling combustion products such as carbon monoxide into your living space. Whole house fans can be noisy, especially if improperly installed. In general, a large-capacity fan running at low speed makes less noise than a small fan operating at high speed. All whole house fans should be installed with rubber or felt gaskets to dampen noise. You can set a multi-speed fan to a lower speed when noise is a problem. You may be able to use the heating and air conditioning ducts in your home as a means of whole house ventilation. This would involve installing an intake duct to pull air into an attic-mounted system that directs the air into your heating and cooling ducts. A damper would control exhaust air from your home into the attic. Check with a local professional to find out if this option is right for you.